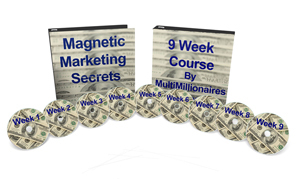 This 9 week course was hugely popular and helped many who were on this course create millions of dollars of success. Includes: Magnetic Marketing Secrets to Self-Publishing, How to write Books/Business Plans, PR, Getting Your Product to the Marketplace, Getting Distribution and so much more. Step-by-Step. This BRAND NEW Intensive Course has Turned Students, Who Followed the Proven System, to Making Tens of Thousands to Millions of Dollars. People paid $450 to be part of this 9 week course. It could be worth MILLIONS TO YOU!